Hydraulic fracturing, also known as “fracking,” is the highly controversial practice of injecting millions of gallons of water and toxic chemicals into the ground in order to extract natural gas. Fracking has been linked to air pollution, groundwater contamination, and harms to property rights in other states. Other problems associated with the industry include massive methane emissions (a driver of climate change); the lack of safe disposal options for millions of gallons of toxic wastewater; heavy truck traffic on small rural roads; and damage to local infrastructure. Why is fracking wrong for NC? North Carolina has complex geology that makes fracking more complicated and risky for our state, and no safe options exist for disposing of polluted wastewater. In addition, geologists doubt the existence of large deposits of natural gas in the state. This makes it more likely that, if fracking happens here, we will get marginal operators who are less trustworthy. The problems that other states are experiencing with fracking show that it cannot be done safely and it isn’t right for North Carolina. In Pennsylvania alone, there have been 243 suspected cases of water contamination due to fracking*. The NC Mining and Energy Commission rules for fracking will not adequately protect North Carolinians from the risk of water contamination. 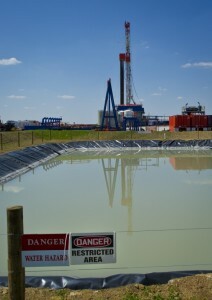 Rules for how closely a fracking well can exist to a private water source are not adequate in protecting groundwater. In addition to that, the rules allow open-pit and open-tank storage of fracking waste fluid, which poses a risk to surface and groundwater. Fracking wells emit toxic chemicals such as benzene and air pollutants that have been linked to chronic nose bleeds and birth defects. North Carolina’s regulatory program does not address these emissions. Forced pooling, or compulsory pooling, is the ability of a fracking company to force an unwilling landowner into a drilling unit under certain circumstances. North Carolina legislators and regulators have expressed an intent to allow forced pooling to happen in the state once fracking permits are issued. In other states, fracking has turned peaceful rural towns into heavy industrial zones with sharply increased housing costs and crime rates. In addition, each fracking well requires 1 to 8 million gallons of water, and which must be trucked in and then back out in large tanker trucks. The huge increase in truck traffic puts stress on rural roads that weren’t built to withstand that kind of heavy traffic.